Burundi is an East African country that has some cultural ties with Central Africa, but like many other African countries, it is rich in culture and wildlife. With Tanzania being one of its neighbors, Burundi is the home to many wildlife species. Plus, exploring African culture is one of the reasons people go to Africa in the first place, and you will find plenty in Burundi. Even so, the nature reserves and the national parks remain the main attractions. In a country where there are only two museums and not many landmarks, the wildlife is pretty much what you can observe. As far as the visa policy is concerned, Burundi has one of the most restrictive rules in the world. And do not understand that as in you are not given permission to visit Burundi. It is more like almost every nationality in the world needs to get a visa to cross its borders. Only 6 nationalities, all from African countries, can enter Burundi without a visa. We are referring to the citizens of Democratic Republic of Congo, Kenya, Rwanda, South Sudan, Tanzania, and Uganda. All the other nationalities in the world are required to apply for a visa at the nearest embassy or diplomatic mission. In Europe, you can apply for a Burundi visa at the Burundi Embassy in Belgium. 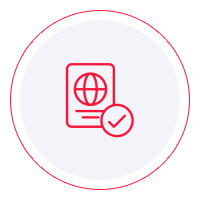 It is redundant to use out Visa Checker at this point because there are only 6 visa-exempt countries and they are all mentioned above. However, you can use it for another reason as well. The tool not only tells you whether or not you must apply for a Burundi tourist visa, but it also lists the nearest embassies whose services you can use. It also provides contact information. So, just select your country of origin, pick Burundi as your destination, and you will get what you need. We regret to tell you that at this moment we do not process visa applications for Burundi. It is not one of the countries supported by iVisa. It is pretty hard to get a visa on arrival for Burundi, let alone an electronic visa. However, we would like to help with whatever information we can give you. As a result, our support service is available 24/7 and is entirely free of charge. One of the things that should be on your mind before applying for a Burundi visa is meeting the requirements. Our recommendation is to call the embassy to find that out. The information you read online should be used just as a reference. Nevertheless, we are sure that you need a passport that has enough blank pages and a minimum of validity of 6 months from the date of arrival in Burundi. Other than that, you should call the embassy and find out. Although we cannot help you with the Burundi visa application process, we hope that the information above is somewhat helpful. As soon as electronic visas are available for Burundi, we will be able to help you every step of the way. Until then, we wish you a smooth application process at the embassy.